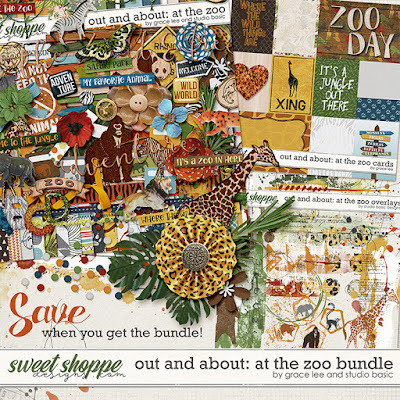 Out and About: At the Zoo Bundle is the first of a new 'get-out-and-explore' themed kits! Exciting, bold patterns, plenty of animal imagery and word art, and four fantastic alphas all contribute to a wonderfully wild kit, perfect for scrapping photo's from your family's day out at the zoo, your kid's wildlife obsessions or even journaling about your inner wild side...grr! 87 elements. The elements included are: 1 bear, 3 bows, 3 buttons, 1 cheetah, 1 elephants, 2 feathers, 8 flowers, 5 pieces of foliage, 3 frames, 2 giraffes, 1 lion, 3 ribbons, 1 ricrac, 1 confetti scatter, 1 sign post, 2 signs, 2 pieces of string, 3 washi tape, 1 vine, 2 zebras, 1 alligator, 2 'welcome' arrows, 2 banners, 2 mixed media brushes, 1 butterfly, 1 ephemera, 2 flairs, 1 gorilla, 7 labels, 1 panda, 1 staple, some stitching, 2 tags, 4 patterned wood slices, 11 word art.